It’s been a year now since we have been helping Sam and his ‘Share Love with a Friend’ Project, which assists poor families with disabled children in our community. In cooperation with the Social Welfare section of the Nong Prue Municipality, we hand out rice and milk to the families on the first Saturday of each month. Despite the inconvenience of traveling with handicapped kids, especially on two wheels, many of the families are still willing to come out on their own to collect their monthly foodstuffs at the general distribution point in Nong Prue. 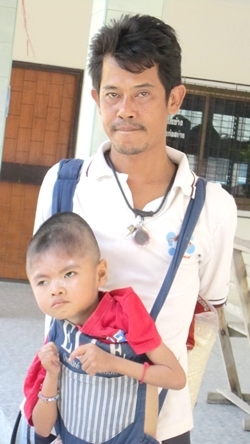 Previously, Somchai had to get around on his motorbike with his 8-year old son, Flook, strapped to his shoulders in front of him in an infant carrier. However, there are still others with severely handicapped children without the means to make the trip, which then requires doing home-deliveries. 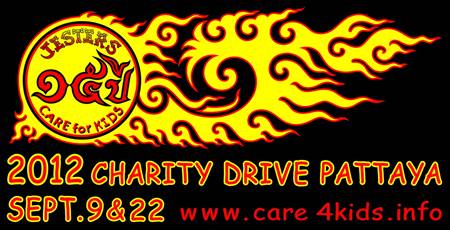 Of course, we are glad to do this as it keeps us directly connected with the kids and allows us to find other ways to help them. In addition to the regular milk and rice-giving, there are other ways we also help these special kids, such as, providing wheelchairs and walking aids. Of the kids that already have them, many need replacements due to wear and tear, or because they are too heavy and clumsy to manhandle and/or became too small for the user. Yet, still another way we help these families is by improving their mobility, and capacity to collect recyclables, as well as facilitate the transporting of their children. The easiest way to do this is to put a sidecar on their existing motorbikes. Recently, we furnished a family’s with such a sidecar, which was specifically designed to transport their disabled son more easily; in this case it also needed a canopy over it. 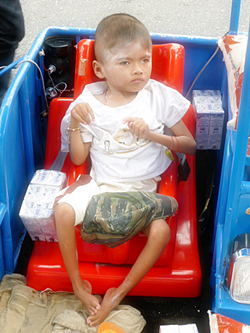 Previously, the father, Somchai, had to get around on his motorbike with his 8-year old son, Flook, strapped to his shoulders in front of him in an infant carrier, which was awkward to say the least. Flook sits comfortably in the new sidecar. Because his wife is a waitress in a restaurant, he has to take his son with him when he goes to his construction jobs. 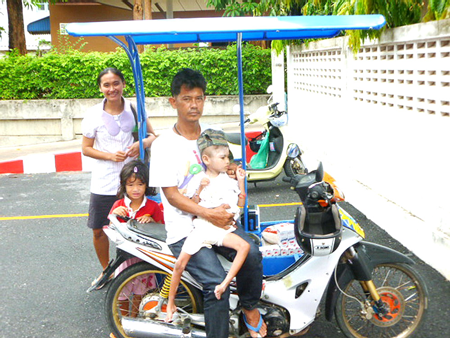 It was difficult before, but with the new covered sidecar, Somchai now has a place to keep his son, not only in sight, but also comfortable and protected from the sun and rain. Looking after kids is especially difficult for low income families, and compounded when the children are not able to go to school or fend for themselves. The parents often have to work long hours every day and without any other options for child care, they must manage themselves. Our goals for the families with special children, under the banner of the Share Love with a Friend Projects, are not only to distribute rice and milk every month, but also to provide wheelchairs when needed and to modify vehicles so that they are more useful for eking out a living and easier for transporting their special children. Flook’s family gathers around the bike with the new sidecar.